Abstract: There has been a lot of interest in carbon nanotubes because of its many outstanding properties, e.g. the high tensile strength, heat conductivity, and the unusual electronic properties. Due to the unusual electronic properties of the parent material graphene, a carbon nanotube can be either metallic or semiconducting depending on the chirality of the tube. This talk will give a brief overview of current applications and focus on the recent research on the optical properties of carbon nanotubes, the strong excitonic effects particular to a 1D system, and some future possibilities. Biography: Anna K Swan is an Associate Professor of Electrical and Computer Engineering at Boston University. Her research laboratories are located in the Photonics Center. Prof. Swan received the B.S. degree in physics engineering from Chalmers University in Gothenburg Sweden, and a Ph.D. in Physics at Boston University in 1994. For her Ph.D thesis work she developed a new method of measuring surface spin ordering using meta-stable He scattering, work which was awarded the Nottingham price and the Morton M Traum award. In 1994, she joined the Solid State Division, Oak Ridge National Laboratory, Oak Ridge, TN, as a Wigner Fellow where she studied the initial stages of thin film growth kinetics and structural and morphological effects on thin film magnetism. In 1999, she joined the Electrical and Computer Engineering Department, Boston University, as a Research Assistant Professor. Her research topics are now clustered around high spatial resolution spectroscopy. 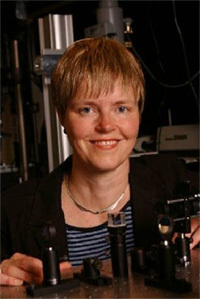 Her active topics are spectral self interference as a means of improving fluorescence microscopy resolution, and the optical properties of single carbon nanotubes.